This morning I fitted a Ball Ram Mount to my Yoke on the Viffer. I also purchased a universal PDA cradle and a bracket to attach it to my new Ball Mount. 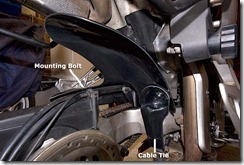 It was a struggle getting the plastic plug out of the Viffer’s Yoke. In the end I had to punch a hole through the middle of the plug to be able to pull it out with a set of long nose pliers. After pulling it out I realised that the middle of the Yoke had rusted slightly which was causing the plug not to come out. After assembling all the parts and tightening the Ball Mount. I then fitted the cradle to the mount with the PDA in it. 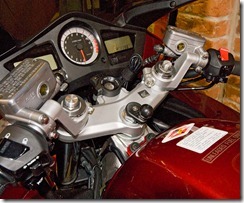 I then sat on the bike and adjusted the mount and cradle into the desired position. 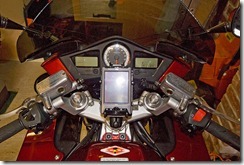 I was able to position it so that I can easily see the PDA and also have full view of all the dials on the bike. I am very pleased with the overall outcome and very happy with the quality of the equipment. 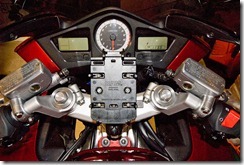 I used the following Ram Mount items purchased from GPS Warehouse. 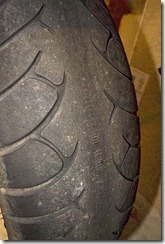 She chose to have a set of Michelin Road Pilot 2 fitted as I think they are a really good and long lasting tyres. 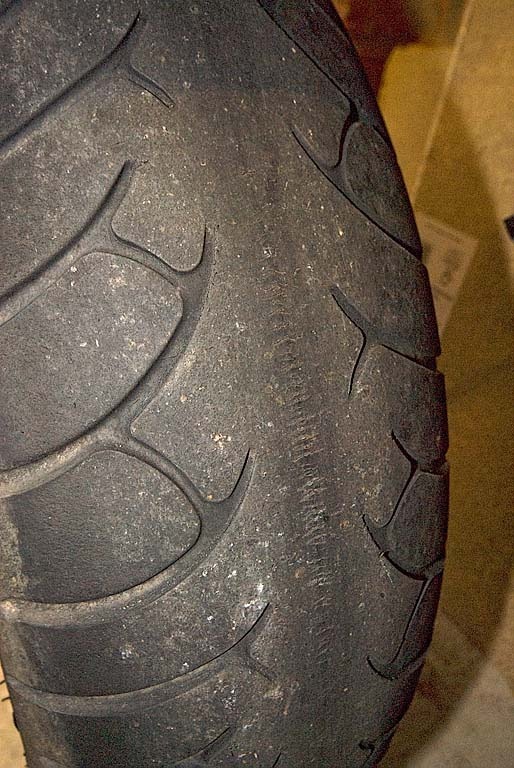 Her previous tyres Metzler Roadtec Z6 lasted a long time but they don’t have any grooves across the middle of the tyre or any wear indicators. Due to this we thought she had plenty left on them until all of a sudden they started to crack up in the middle. Again we used Bike Tyre Services to change them at our house. He did an excellent job as always. 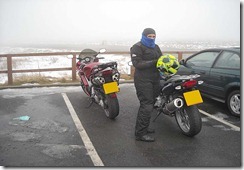 Helen and I went out yesterday with NUKB on a rideout to the SE Lake District including Kirkstone Pass and then over to the Dales via Hartside. Scotsy organised and led the route to his usual high standards. 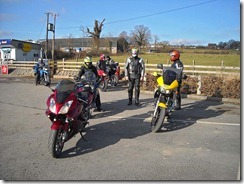 We met up at around 9:30am at the Tickle Trout. Considering the slightly miserable conditions, we had a very good turnout especially for this time of the year. 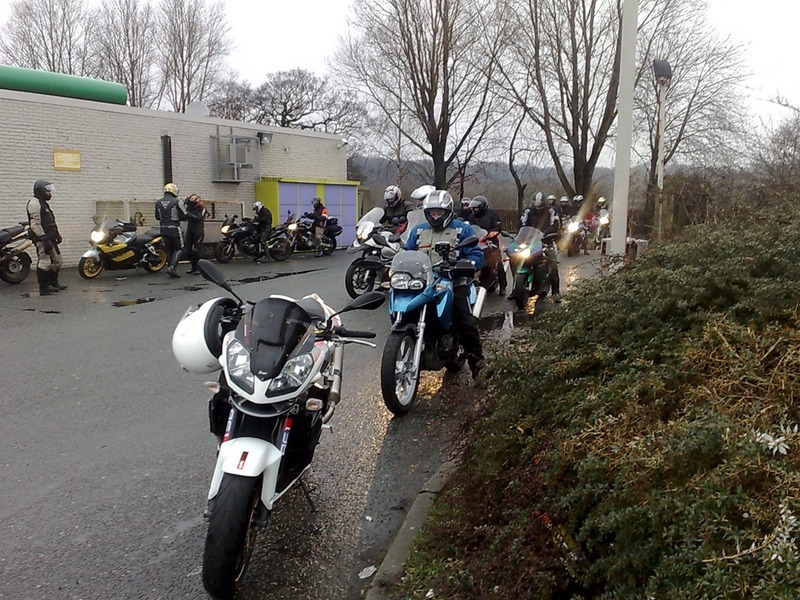 We left the Tickle Trout in convoy and proceeded up the M6 to junction 35 at Carnforth. We then headed up the A6 towards the Lake District. 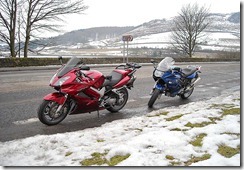 From here we took the A590 up to Lindale then proceeded on very muddy minor roads past Cartmel and Holker Hall. We re-joined the A590 briefly at Haverwaite before getting off again and going via Spark Bridge to link up with the A5084. We proceeded along the A5084 taking in the scenery of Lake Coniston, we soon passed through Torver and took the A593 to Ambleside via Coniston. We soon arrived in Ambleside and then negotiated our way up the struggle to the Kirkstone Inn, were we stopped for a much needed break. You can see an on-board video of us leaving Kirkstone filmed by Lil Mike here. 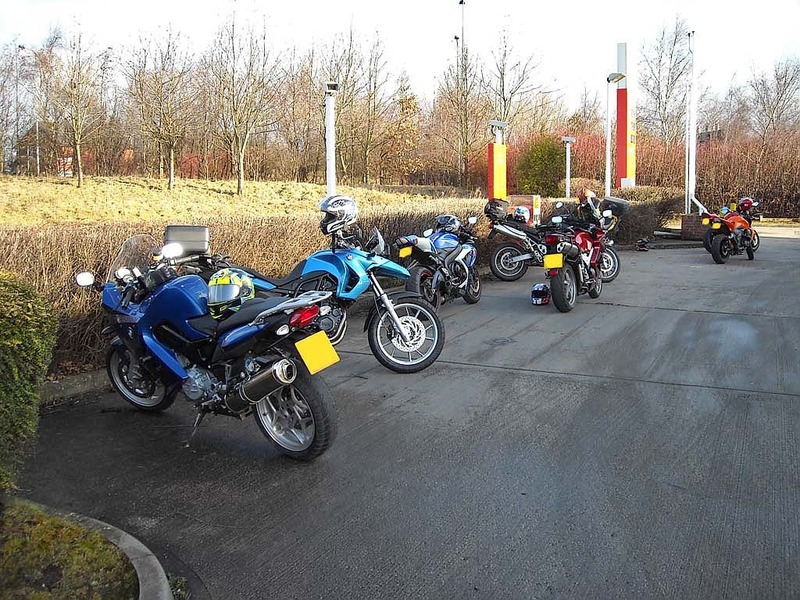 After the much needed coffee break we carried on along the A592 towards Penrith. The road down Kirkstone Pass was fairly dry here so I managed to have a decent run for a while. 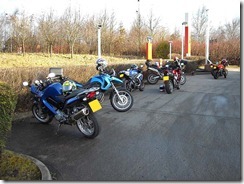 We then crossed the M6 and went down the A686 towards Hartside. We passed through Melmerby and I set myself for the ascent of Hartside. 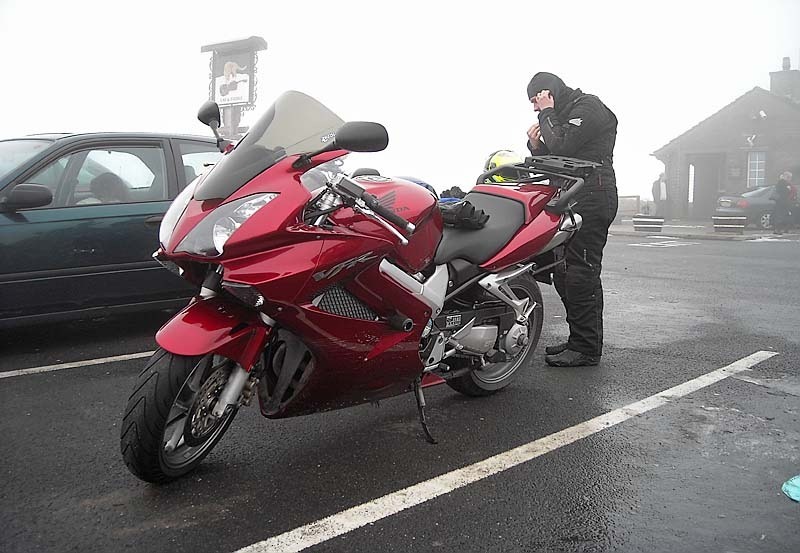 Within no time at all we hit fog and visibility was very poor indeed. We had no other option but to take it easy up Hartside. Which spoiled it for Helen as she couldn’t appreciate the road and its big drops. 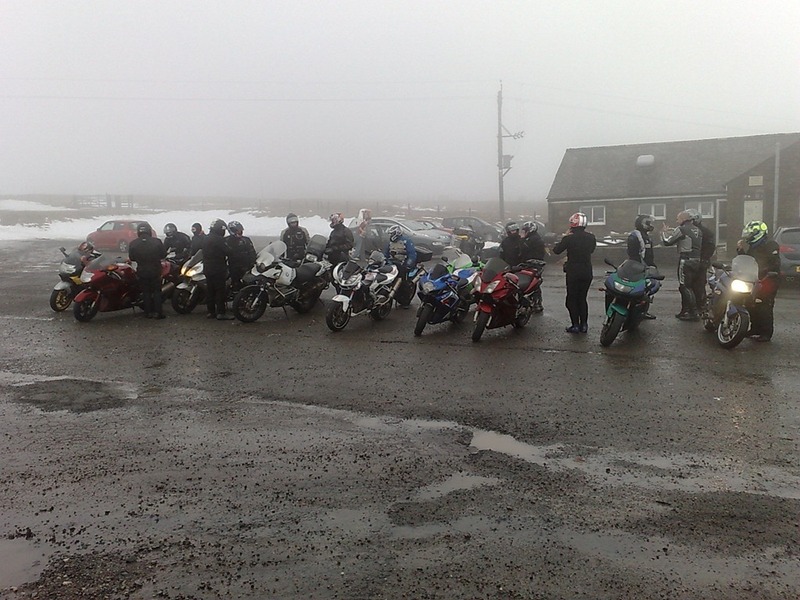 We reached the top of Hartside and could barely see the cafe. Gary was standing at the edge of the road so we could see the carpark turn in. After lunch we proceeded down off Hartside towards Alston, were some of us refuelled. We then headed down the B6277 to Middleton-in-Teesdale. On the way to Middleton we passed loads of cars parked up at the side of the road, to our disbelief we realised that they were all skiers taking advantage of the snow. 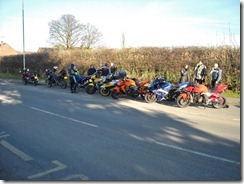 From Middleton we took the B6276 to Brough then the A685 to Kirkby Stephen and the B6259/A684 to Hawes. Helen filled up at Hawes as she had lost some fuel on the way as she hadn’t fully fastened her fuel cap. We then took the B6255/B6479 to Settle via the Ribblehead Viaduct. It was relatively dry on those roads so I managed to have a decent go at them. We stopped in Settle to have coffee and scones at the Naked Man Cafe. 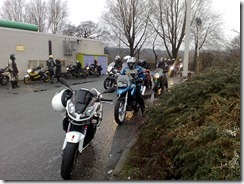 I then led the remaining 6 riders via Wigglesworth and Sawley back to the A59. After we had passed Clitheroe services myself, Helen and Debs headed through Simonstone back home, the others carried on down the A59 towards Preston. 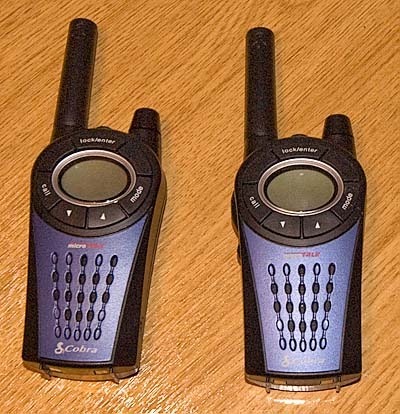 Helen and I used the new comms units today. The operation was a bit hit and miss. On the motorway Helen couldn’t hear anything I said, but I could make out the odd thing she was saying. Below 50mph they seemed to work really well and our voices were clear. Although my voice kept cutting out, may have to adjust the VOX on my end slightly. Also at times the range of the signal was very poor. We will have to test the units with 1 of us on a bike and the other at home to see if we can isolate if either setup is at fault. Due to us going touring to Catalunya in June this year, Helen decided that we needed to keep in touch even when we are out of sight of each other. The only way to do this without the cost of mobile phones charges is via bike to bike radios. So my task was to find a decent set of radios and headsets to do the job. I went for a set of Cobra 975 PMR radios from Bike to Bike. They have a decent range, rechargeable batteries with a charger unit, plenty of privacy codes and channels and most importantly Vox. Can't be doing with push to talk buttons. 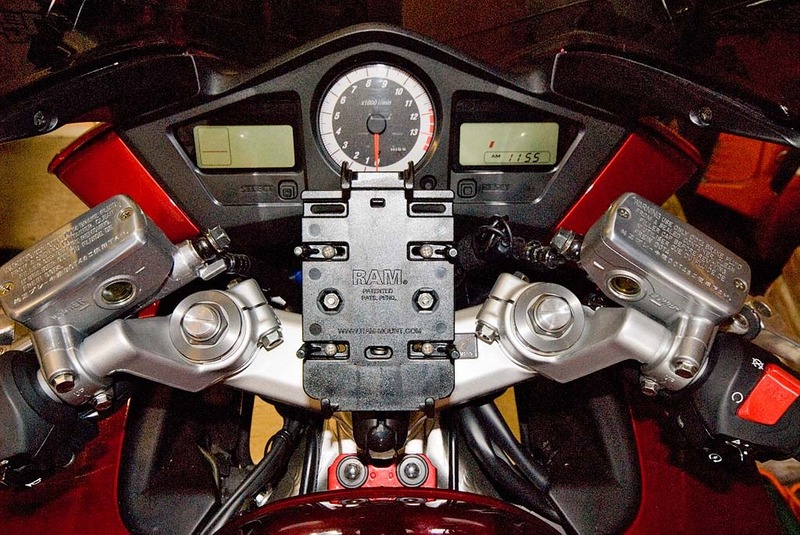 I initially looked at Bluetooth units so we didn't need the problem of wires and I also wanted to integrate my phone and sound from TomTom. Alas after looking at various reviews it seems Bluetooth is more trouble than it is worth. 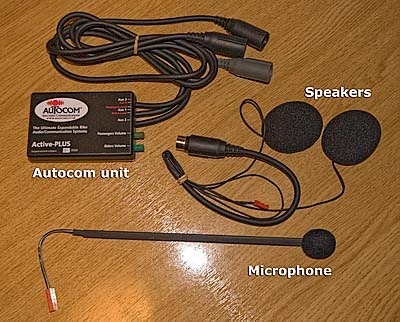 So I looked into the hardwire version instead, I was recommended Autocom units. 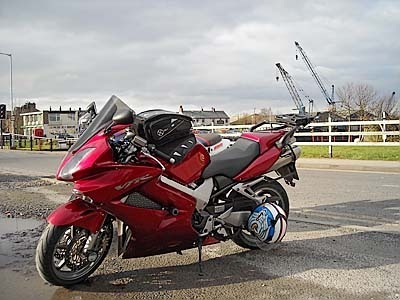 So after a brief visit to their website I came across one of their old 2008 products that would do the job, the Active-Plus Kit 200. 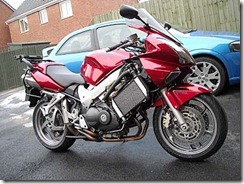 What is even better is that they are currently half price due to new 2009 models coming out soon. 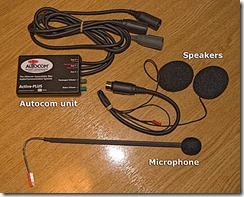 The unit has 4 Aux inputs and leads for a rider and pillon headsets. 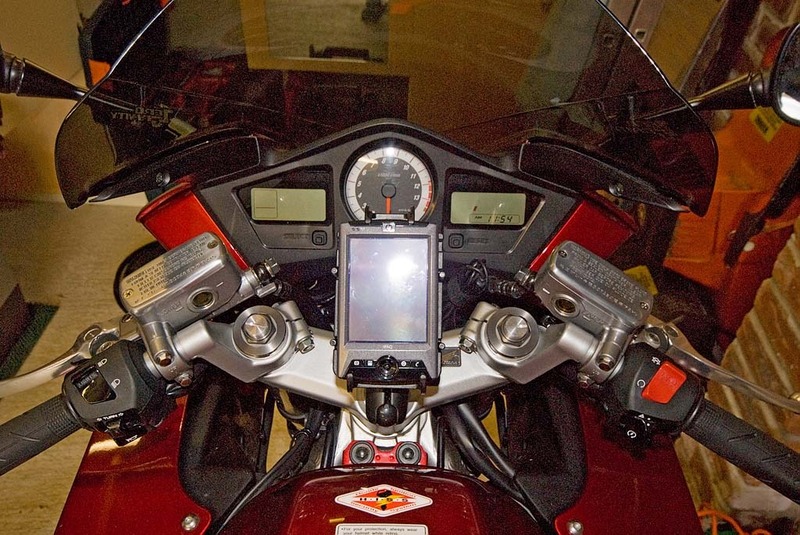 So I can use my phone while riding, listen to navigation instructions from TomTom and talk to Helen via the Cobra radios. I could also listen to our Ipod as well, but I think it might make me concentrate less. Besides when you have a V4 do you really need to listen to anything else. Initial tests are very good and I really like how I can hear my own voice though my own speakers, helps you gauge correct volume and lets you know you are transmitting. 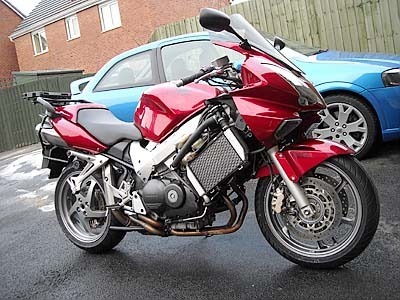 Just need to get out and the bike and test them out for real, initial tests with the blast of a hairdryer would suggest that they will not be affected by wind noise, fingers crossed. 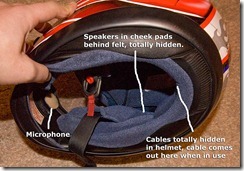 The earphones and mic fitted really well into my helmet and when not in use it is a virtual stealth install. Due to Helen not having one of these units I have installed the headset that came from Bike to Bike, that also installed very nicely and discretely and also passed the hairdryer test. Due to severe corrosion on my original fork mounted tax holder. I decided it was about time I purchased a new tax holder. I got this nice carbon effect one from Hein Gericke and while I had the panels off the bike, I installed it on the left side just above the gear lever. I used one of the water expansion tank bolts to fix it with. 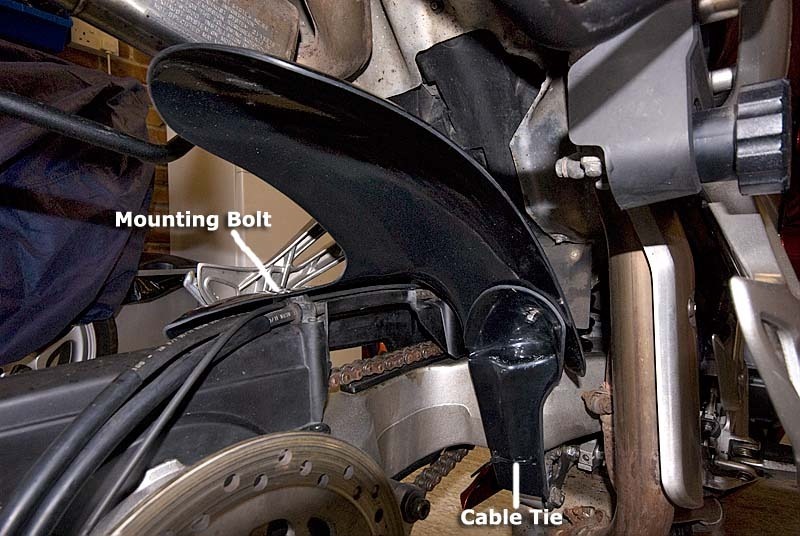 Seemed to have plenty of length on the bolt to be able to hold the tank and holder in place. 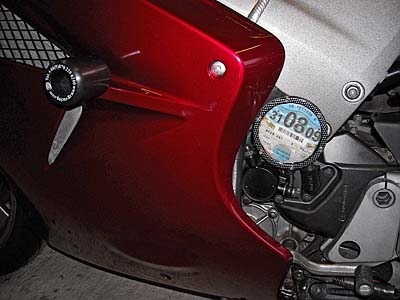 But I did have this location in mind so purchased a holder with a thin bracket on it. 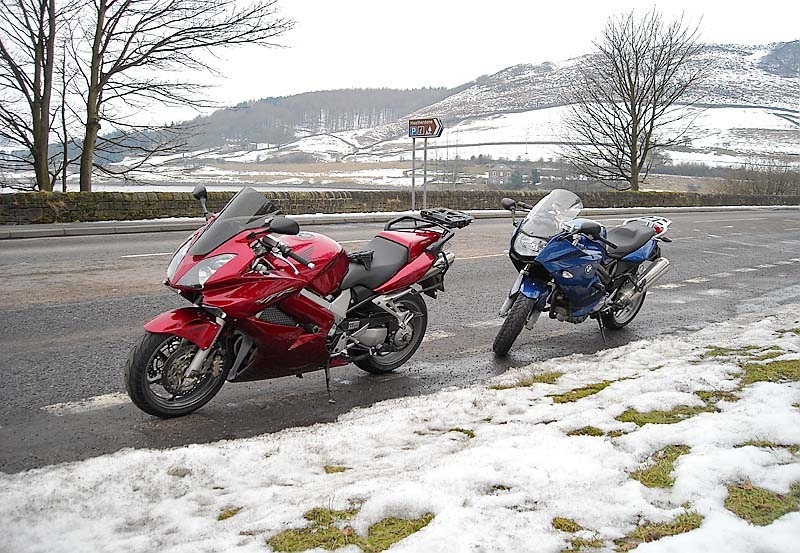 Due to rather snowy weather this week it has been impossible to get our bikes off the drive. 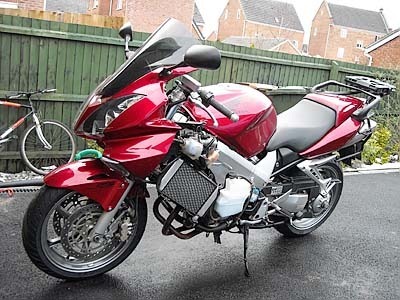 But I did manage to clear the driveway enough to get the bikes out to at least give them a good wash.
After my bike get covered in mud in Normandy last year and recent muddy roads, I decided to remove my fairing panels to give the Viffer a real good clean. As expected loads of mud had collected behind them so it was good to get it off. I also gave the chain a good squirt of cleaner and left it to soak for 15 minutes and it came up really well, it has got some rust marks on it though. The pannier rails are also showing some sign of surface corrosion as well. I also noticed some scratches on the left panel as well. Not sure how they have been caused but I suppose when you actually ride them rather than look at them these things happen. 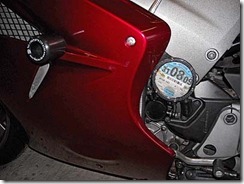 Well with the bike on 9811 miles my rear tyre is shot again, completely past the wear marker across the middle 1/3. I have been very happy with this set of Michelin Road Pilot 2's with their dual compound, that I have opted to have them again. 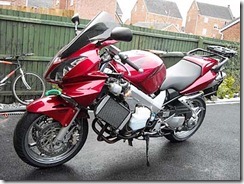 They have lasted for around 6000 miles compared to the 3800 miles that the Metzelers did. 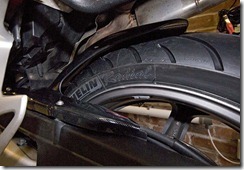 I got the tyres fitted at my home by bike tyre services again for £225 all in, can't recommend the bloke enough. 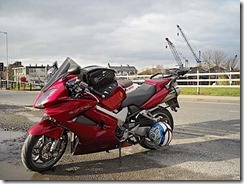 Myself and Helen went on a rideout with NUKB to Glasson Dock today. It was bloody cold today and very windy, we encountered temperatures of -2°C over stocks reservoir. 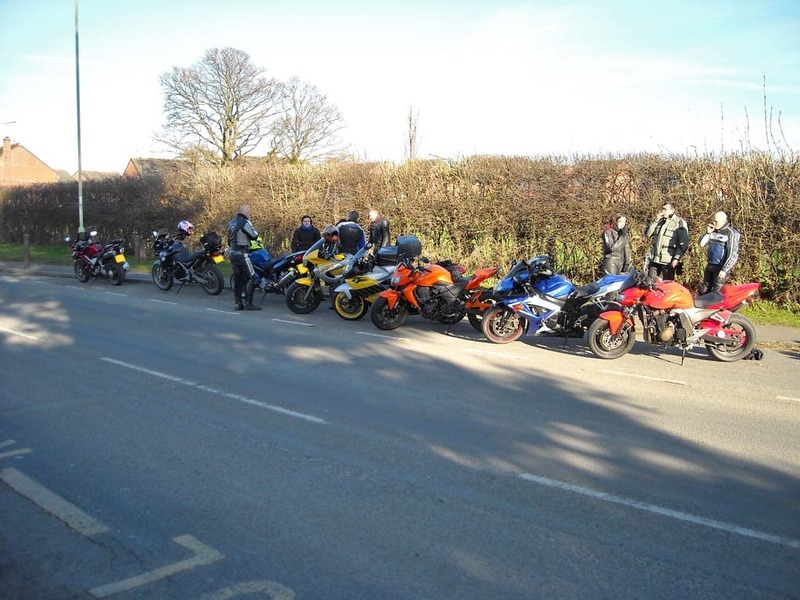 We met up with the majority of people at the Tickled Trout at 11:00am. It was a really good turnout considering it was so cold. Debs led us to Glasson Dock via Broughton, Inskip, Hambleton, Pilling and Cockerham. 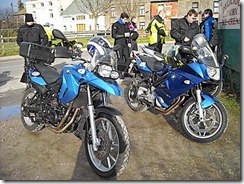 We arrived at around 12:00pm and met a few other new faces there and had a Coffee and Twix to keep us going. Quite a few of the group left us at that point, the remainder of the group headed over to Devil’s Bridge via Quernmore and Caton. On the way up to Devil’s Bridge we encountered a few snow flurries here and there. We decided to head home after Devils as the snow looked like it was coming in. 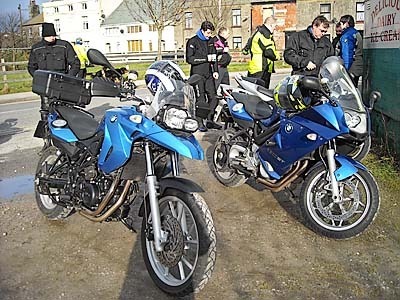 There were a few bikes up at Devil’s Bridge but as usual the arrogant car drivers had decided that they would park in the weekend bike only area. Helen decided to vent her anger about this to one unlucky 4x4 driver that obviously can't read signs and blocked his exit from the carpark, she eventually moved and let him on his way. As soon as he was at a safe distance from us he produced the finger to us, not sure what his young daughter would of made of that. Maybe he will think twice about parking there next time but I doubt it. 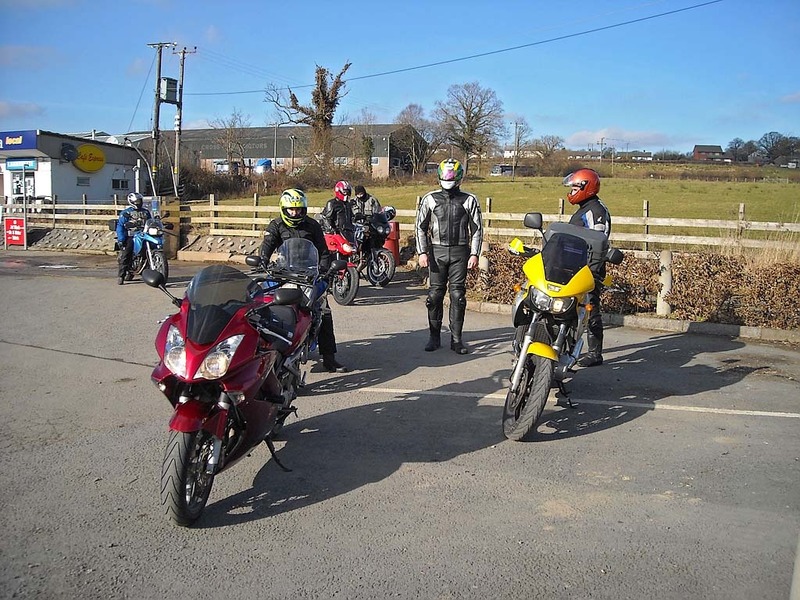 We then got a cup of coffee and some bacon butties and then jumped on our bikes leaving everyone else except Debs at Devil’s Bridge. We proceeded home via Ingleton, Clapham, Gisburn Forest, Sawley, Clitheroe by-pass, Simonstone and then got onto the A56/M66 and arrived home just before the snow flurries came again.